She’s been an absolute blessing to our lives, bringing endless smiles, love and cuddles. For the life of me I’ll never understand how someone could have not wanted her. Her story was that someone got her as a cute pup, then after a few months got bored and left her out in the yard growing thin, unwalked and unloved. A pet-loving neighbour spotted the neglect and volunteered to walk her, eventually taking her in & fostering her for about 5 months. 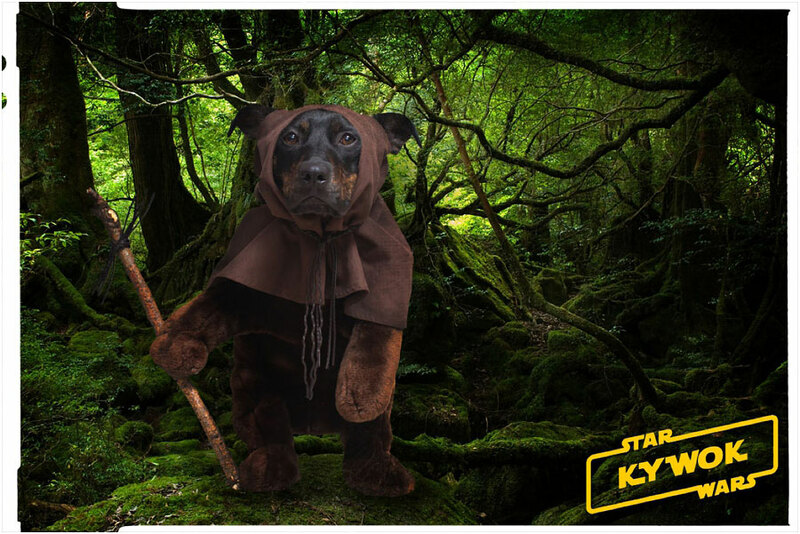 They contacted Sue and the good people at Yorkshire Rose Dog Rescue and her ad was put up on their site saying Kyra was an ‘Ambassador for the staffy breed’. 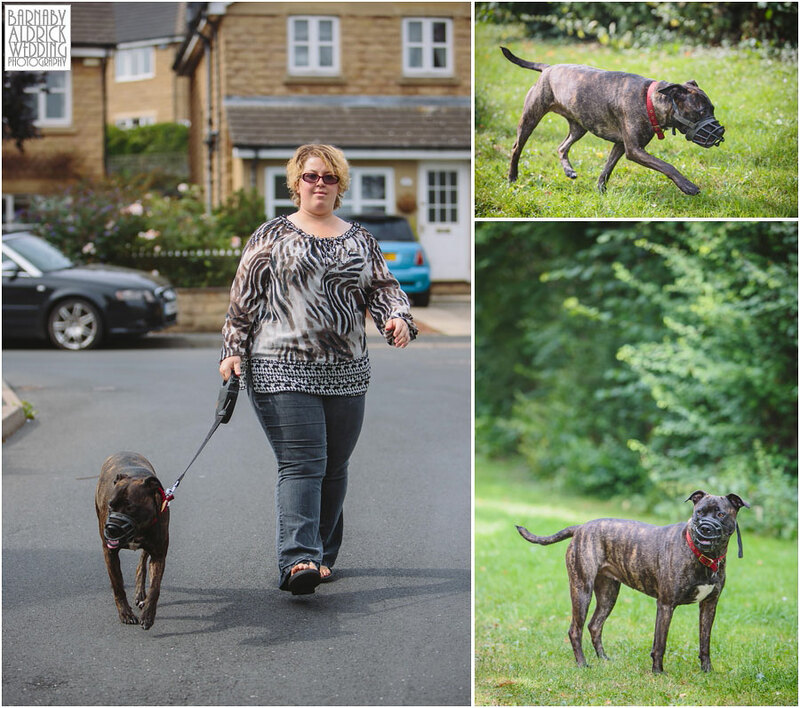 We were in the market for a pooch, and though we’d not considered a staffy (we all know how their reputation sadly preceeds them), saw her ad and visited her at the foster family’s home in Huddersfield. We took her for a walk, saw how quiet and well behaved she was, and how much work the fosterers had done to train her, and after a day thinking about it, we were collecting her for a drive to her ‘forever home’! 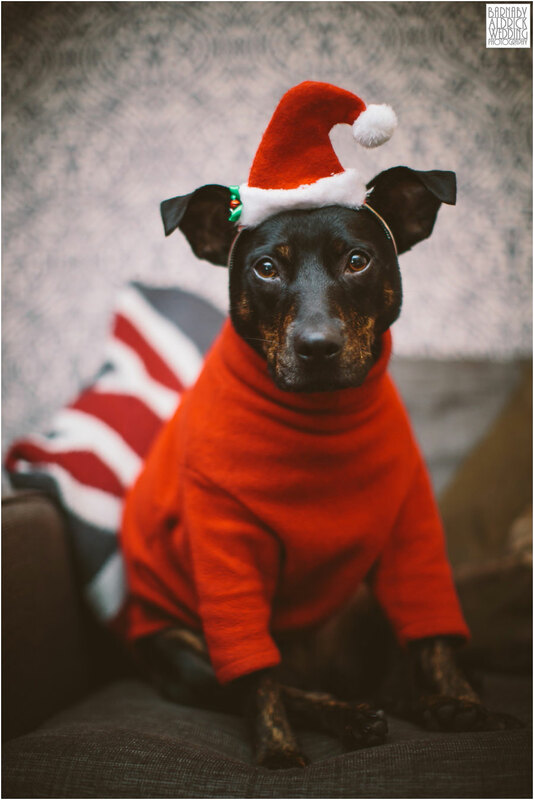 …especially considering I’ve also been known to dress her up on special occasions! When we got her, we estimated her birthday to be in early May, so decided it might as well be May The Fourth, which in a marvellous coincidence is Star Wars day! This was my Christmas card to all my wedding clients last year! 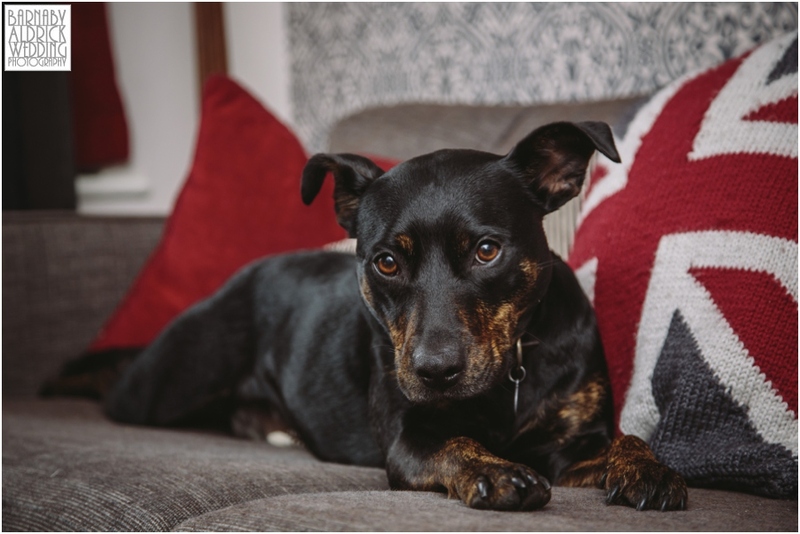 This post clearly isn’t about tormenting your dogs, but you can see what a patient and accepting little pooch I’ve got in Kyra! 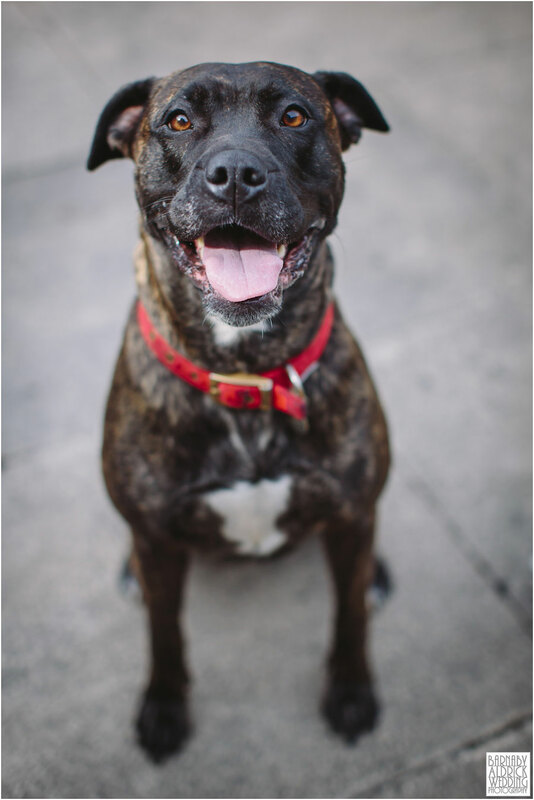 This post is about beautiful Bridget, a 3 year old Staffy / Mastiff cross who’s currently being fostered by Enza for YRDR (on their site here). 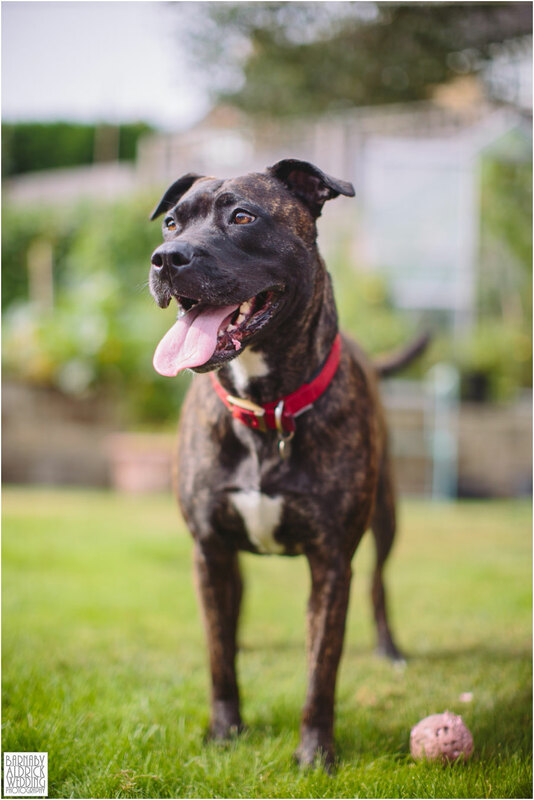 While having been one of the easiest going dogs of the 10+ that Enza’s had, she’s proving to be hard to rehome, having not had a single interested visitor in the full 6 months she’s been in care! To help her find a home Sue at YRDR asked if I’d pop over and take a few nice photos of her to drum up some interest. There are probably several reasons behind why no-one’s shown any interest. On a minor level, apparently brindle (the stripy black/ginger coat colour) dogs are harder to foster. I suppose they look more like mongrels to the untrained eye. But Bridget’s problem is that she’s also quite nervous of strangers and other animals. This can be due to poor socialisation by her first owners, but means she’s a bit suspicious of newcomers. When I arrived to photograph her I was asked to ignore her while she got used to me, and although a tad growly, after 5 minutes we were playing ball games and having lots of fun. A bad start in life has a similarly negative effect on all animals, but as with humans, often time and love can iron out the creases. We’ve fully seen Kyra change as she’s settled into our lives these past 2 years. She used to lie on her back whenever confronted by any kind of threat from another animal, and we’ve seen her develop a new found confidence in our shadow. While Bridget is perfectly fine with most dogs, she finds the more energetic dogs to be too much and this makes her nervous. To avoid her snapping in situations where she’s threatened, Enza has taught her to wear a muzzle when out in public to avoid any situations that may arise. These have a Hannibal Lecter quality, and rarely look particularly appealing, and may be another reason Bridget’s being overlooked. It’s a tall ask for a prospective owner to want a muzzled dog, but she such a lovely girl, both in the house and out, and it’s just a precautionary measure for a nervous dog. Bridget’s other problem is breed, she’s a Bull Mastiff / Staffordshire Bull Terrier cross, and both those dogs have a bad reputation. Being a staffy owner, I’ve got a big problem with society and the media blaming these dogs for associated aggressive breed characteristics. The blame is attributed to the wrong end of the lead. It’s so sad that these large, loyal and loving dogs have been favoured by scumbags, who bully and abuse out fierce traits in their pets for status. I’m pretty sure you can make any dog aggressive with the right amount of mistreatment, and the majority of staffies, rotweilers and mastiffs are wonderful peaceful companions. Instead of legislating ‘dangerous dog acts’ and blaming the breed, I don’t know why owners of aggressive dogs aren’t the ones being fined/reprimanded. Just like you can’t blame a gun for being a killer, it’s got a great deal to do with who’s hands they’re in. It infuriates me when in a park someone’s untrained jack russell snaps at Kyra and when she snaps back and they say “That’ll be the staffy in her”. Grrr! 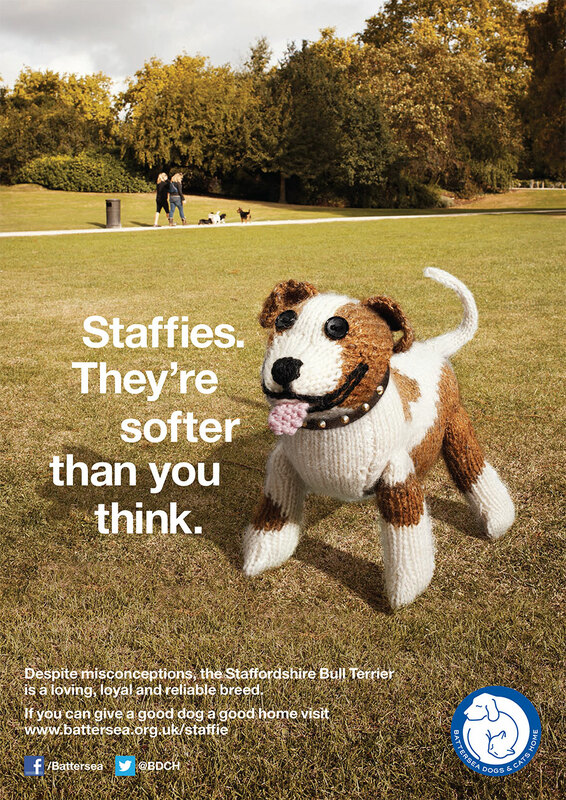 Battersea dogs & cat’s home (with support from Paul O’Grady’s brilliant For The Love Of Dogs TV Series) have been running a campaign (here) about Staffies being ‘Softer than you think’, as preconceptions about these dogs breeds are so ingrained and embedded with prejudice. It’s true that historically these bull-breeds were used to fight, and can be particularly fearsome with their large bite and strong jaws. But apparently a consequence of their being in the fighting circuit often meant that they were more reliant on their masters to bring them back to health, and so created a stronger bond with humans than many other dog breeds. Whether this is true or not, it helps explain why these dogs simply want to be with people. 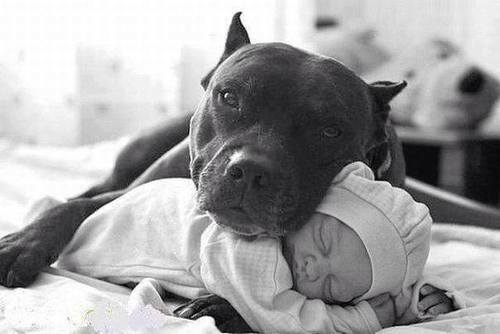 Equally, staffies are known as the ‘nanny dog’, as a consequence of how tolerant and protective they are of children. It’s unwise to leave children of any age unsupervised with any dog or cat, however domesticated, as they’re animals. Children don’t know that pets don’t like being poked in the eye and dogs and cats like to sit where it’s warm and have been known to smother children’s warm faces. But back to lovely Bridget, Enza has put in lots of work teaching her loads of tricks she’ll show anyone who has cheese! 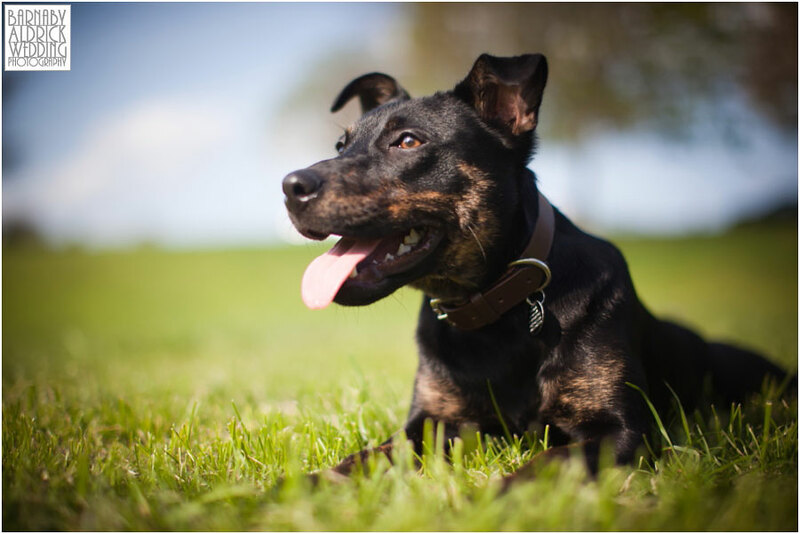 She so loves to play, especially ball games, but isn’t the most energetic dog so after a short play she is very happy to just curl up and chill. For me, the majority of the pleasure of owning a dog comes from their lifelong companionship inside the house, rather than out on a walk. 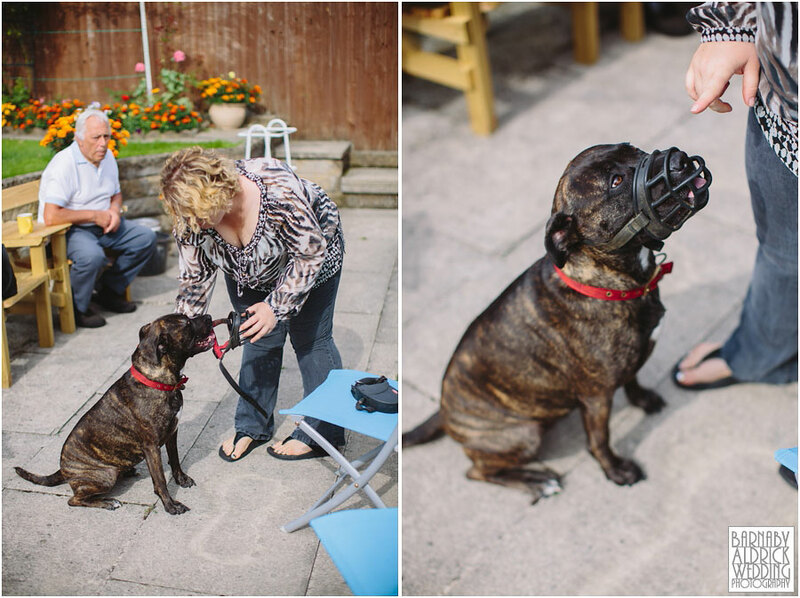 Muzzle & dog-wariness aside, at home Bridget loves nothing more than fuss and attention, and getting lots of cuddles. 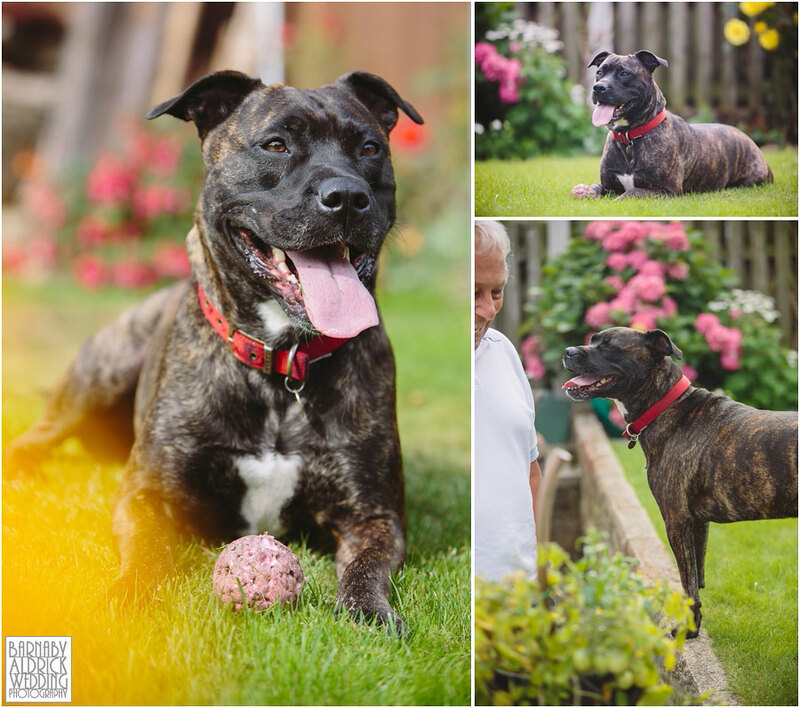 In the hands of sensible people who’ll give her the confidence to settle into her new home Bridget would make a wonderful member of the family as she is a very loving girl. 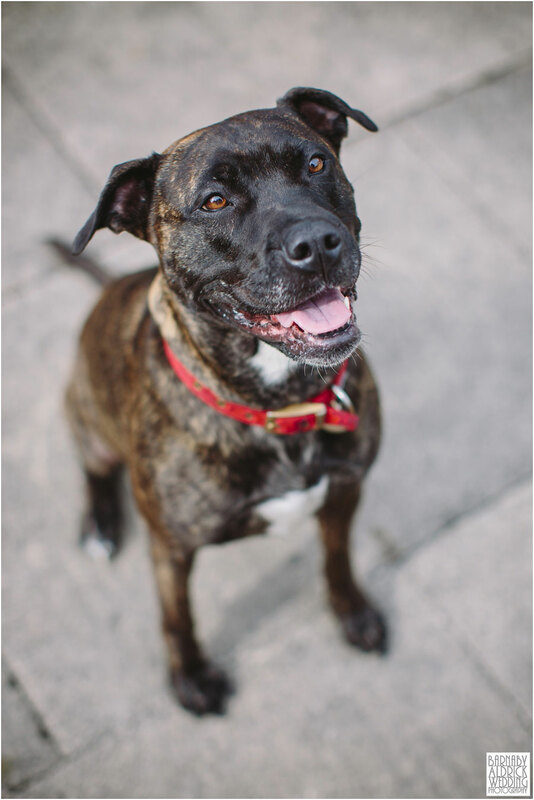 You can read more about Bridget on the YRDR site here, and her fosterer Enza would love to talk to you more about her, so if interested (or if you know anyone who may be) please to call her on 07738231734 or email YRDR on enquire@yorkshirerosedogrescue.co.uk. Fosters are important people in the YRDR chain to be able to take on new dogs in need, so if you can help find Bridget her ‘forever home’ you’d be doing both Bridget and the dog world a great deed! ps. 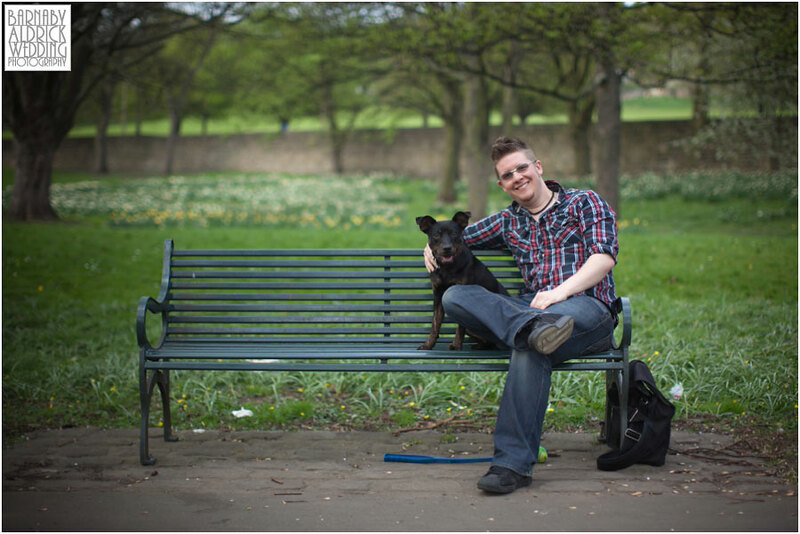 YRDR are throwing a Doggie Fun Day on Sunday 29th September 2013 at Oakwell Hall Country Park (WF17 9LG) from 11am. Kyra & I’ll be there!